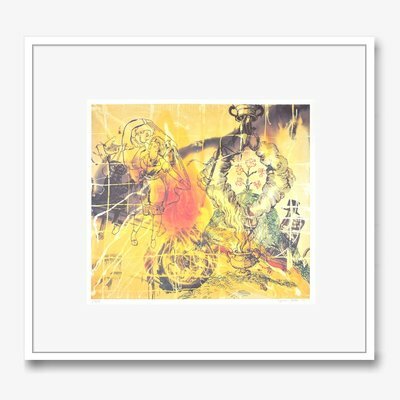 You would like to be informed about Sigmar Polke's new arrivals in advance? Register now for free! Together with his companion Gerhard Richter, Sigmar Polke is considered to be the most important artist of the contemporary. 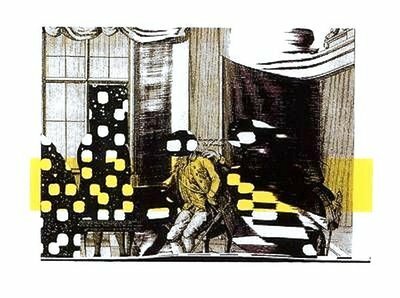 Sigmar Polke was born on 13 February 1941 in Oels, Lower Silesia. After the end of the war, the family fled to Thuringia, from where they left for the Federal Republic of Germany, at first to West Berlin and, eventually, to Dusseldorf. From 1959 to 1961, Polke trained as stained-glass artist in Dusseldorf-Kaiserswerth. In the following year, he took up his studies under Joseph Beuys, Gerhard Hoehme and Karl Otto Goetz at the Kunstakademie Dusseldorf, which he completed in 1967. During the early 1960s, starting with his first raster drawing (Lee Harvey Oswald), he created his first raster images. 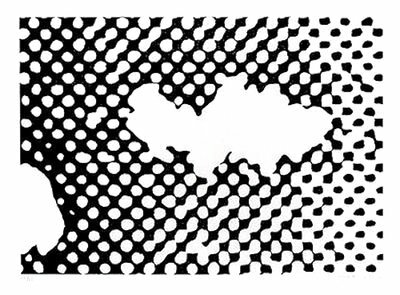 Polke used images from news magazines that were printed in simple halftone and consisted of dots for his by now iconic raster images. He then transferred the dots that he had previously enlarged in a nearly pointillistic style on canvas, but put new spots in the image and thus manipulated the journalistic statement of the original photograph. Simultaneously, an ironic reference to famous American contemporaries' screen prints was formed, such as Andy Warhol, Roy Lichtenstein and Robert Rauschenberg. At the same time, Polke and his fellow students Gerhard Richter, Mandfred Kuttner and Konrad Lueg originated the School of Capitalist Realism, an artistic community that behaved as critically towards Socialistic Realism of the East as towards the pop culture of the West and thus tried to unveil the ideology behind the two systems. The community started with the conception and realisation of Leben mit Pop - eine Demonstration für den Kaptalistischen Realismus. The three artists hosted their first Demonstrative Ausstellung (demonstrative exhibition) at Kaiserstraße 31A in Dusseldorf. The artist group was characterised by an ironic dealing with products of the everyday consumer world and the critical use of everyday clichés of the Biedermeier-like post-war society of the Adenauer era. The appreciatively satirised Capitalist Realism on the other side of the wall whose doctrine they could escape from by relocating to the West. Wit, irony and ambiguity have been characteristic for Polke's artworks since these early years. In his artworks he monumentally draws attention to trivial objects such as socks, sausages or pledges from travel brochures. 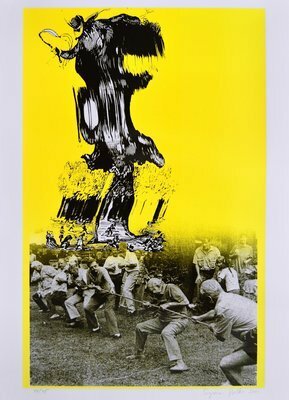 In 1966, Polke received the Kunstpreis der Jugend and opened his first solo exhibition. From 1970 to 1971, Polke was a visiting professor and, eventually, full professor with the Hochschule für Bildende Künste in Hamburg from 1977 to 1991. In Hamburg, Polke lived and worked at the Willicher Gaspelshof, some kind of artist commune, at which many of Polke's friends were guests again and again. Polke relocated back to Cologne, where he lived and worked until he died, in 1978. During the 1970s and 80s, the artist travelled around the whole world, which lead him to Australia, Afghanistan, South-East Asia and Papua New Guinea. The camera gained more and more importance for his oeuvre over the course of his travel activity. A more and more experimental character prevailed in photography as well as painting, which included coincidence and autonomous chemical processes into his oeuvre. During the late 1970s and the early 1980s, Polke took part in important exhibitions of contemporary art in West Germany regularly. In 1972, 1977 and 1982, Polke participated in documenta 5 to 7. Polke's artworks were displayed at the exhibitions Zeitgeist (1982) and Von hier aus – Zwei Monate neue deutsche Kunst (1984) in Dusseldorf. A highlight of his artistic career was the participation in the Biennale in Venice in 1986. He exhibited thermosensitive images that gleamed in different colours depending on the temperature of the day in the German pavilion. He was given the Golden Lion for the best artistic performance for this artwork. 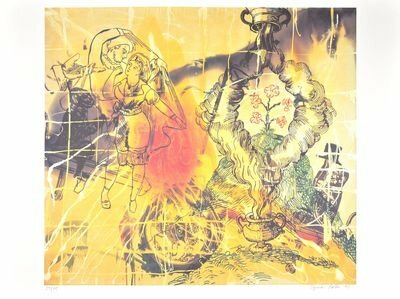 A comprehensive retrospective regarding Polke's oeuvre took place at the Kunst- und Ausstellungshalle der Bundesrepublik (art gallery and exhibition hall of the Federal Republic of Germany) in Bonn and at the Galerie der Gegenwart, Hamburger Bahnhof in Berlin in 1977. 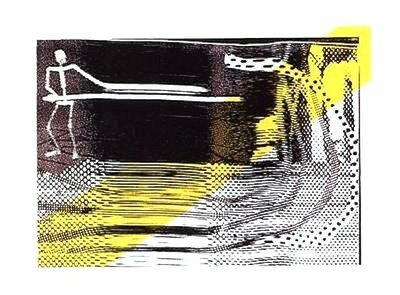 Polke received his first public assignment almost ten years later in 2006. He renewed the glass windows at the Grossmünster in Zurich and was able to go back to the roots of being a stained-glass artist in this way. The five glass and eight agate windows were finished in November 2009. Sigmar Polke was no public person. The more he turned into a star of the international art world, the more he shut himself away from the public in order to primarily communicate with the viewer through his artwork. 2003 Grotesk! 130 Jahre Kunst der Frechheit - Haus der Kunst, Munich; Schirn Kunsthalle, Frankfurt a.M.
...der ganze Körper fühlt sich leicht und möchte fliegen..., in cooperation with Chris Kohlhöfer, Dusseldorf 1969, 35’. Sigmar Polke. Rasterfahndung, published by Klaus Staeck, Göttingen 2011. Sigmar Polke. Wir Kleinbürger! Zeitgenossen und Zeitgenossinen. Die 70er Jahre, published by Petra Lange Berndt/Dietmar Rübel, Cologne 2009. Polke. Eine Retrospektive, exhibition catalogue Museum Frieder Burda Baden-Baden; Museum Moderner Kunst Wien, Ostfildern 2007. Sigmar Polke. Werke und Tage, exhibition catalogue, Kunsthaus Zürich, Cologne 2005. Alchemie des Sehens: Hermetische Kunst im 20. Jahrhundert: Antonin Artaud. Yves Klein. Sigmar Polke, Dissertation, Cologne 2003. Daphne, Sigmar Polke, published by Reiner Speck, Cologne 2003. In the Power of Painting. Andy Warhol, Sigmar Polke, Gerhard Richter, Cy Twombly, Brice Marden, Ross Bleckner, published by Peter Fischer, Zurich 2000. Drucksachen oder die Kunst der Kommunikation. Sigmar Polkes Editionen 1963-2000, Martin Hentschel, in: Stuttgart 2000, p. 361-398. Sigmar Polke. Die gesamten Editionen 1963-2000, published by Jürgen Becker/Claus von der Osten, exhibition catalogue, Württembergischer Kunstverein, Ostfildern 2000. Sigmar Polke. Die drei Lügen der Malerei, exhibition catalogue, Hamburger Bahnhof Berlin, Berlin 1997. Sigmar Polke. Der Traum des Menelaos, Anne Erfle, Cologne 1997. Sigmar Polke, exhibition catalogue, Stedelijk Museum Amsterdam, Amsterdam 1992. Athanor, Sigmar Polke, Katalog Deutscher Pavillion, 42. Biennale di Venezia, Venice 1986. 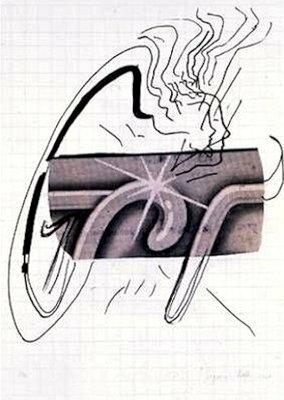 A Project by S.P., Sigmar Polke, in: Artforum XXII 4, New York 1983. Day by Day... they take some brain away, Sigmar Polke, in: exhibition newspaper 13. Bienal Sao Paulo 1975. Registro, Sigamar Polke, in: Interfunktionen 10, Cologne 1973. 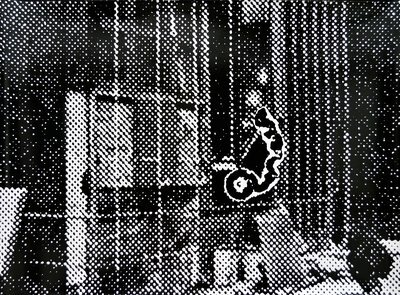 Bizarre, Sigmar Polke, Heidelberg 1972. 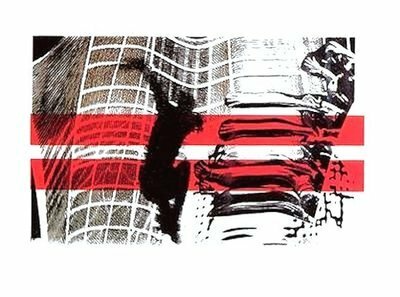 Höhere Wesen befahlen, Sigmar Polke, Berlin 1968. Textcollage, Sigmar Polke/Gerhard Richter, in: Katalog Galerie h, Hanover 1966.